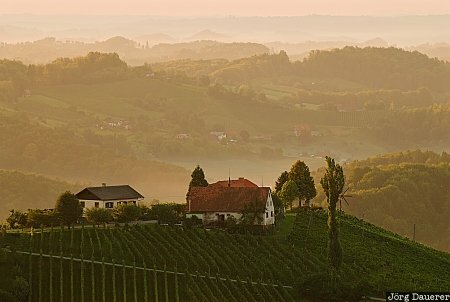 A farmhouse in front of the rolling hills of the vineyards near Gamlitz back-lit by the rising sun. Gamlitz is in the south of the state (Bundesland) Styria (Steiermark) in Austria. This photo was taken in the morning of a sunny day in August of 2007. This photo was the image of the month in May of 2014. This photo was taken with a digital camera.